PCGS has prepared special inserts featuring the AMF logo juxtaposed against the sun rising behind the earth. These commemorative coins will also receive the First Strike® designation, when eligible, and Apollo 11 50th Anniversary pedigree. The new Apollo 11 commemorative coins, and other specified U.S. and world coins will be eligible to receive the AMF label. A portion of the proceeds received by PCGS from submitters for the grading and encapsulation of the coins commemorating the 50th Anniversary of the first moon landing will be donated directly to the Astronauts Memorial Foundation. AMF, which is based at the John F. Kennedy Space Center in Florida, was founded in the wake of the Space Shuttle Challengeraccident in 1986. AMF is the proud sponsor of the 42-foot high by 50-foot wide polished granite monument known as the Space Mirror Memorial. The National Memorial, also located at the John F. Kennedy Space Center on Merritt Island, Florida, glows with the names of astronauts who have given their lives in the line of duty. "The Astronauts Memorial Foundation is excited about partnering with PCGS on the grading and encapsulation of these historic Apollo Commemorative Coins. We chose to work with PCGS due to their high-regard in the numismatic community and the safety, security, and aesthetics of the PCGS holder," said Thad Altman, President and CEO of AMF. "AMF’s mission is to memorialize the twenty-four astronauts who have lost their lives in the pursuit of space exploration and to educate future generations to become the explorers of tomorrow, we feel that this special label, with the added benefit of being available to coins beyond just the 50th Anniversary Commemorative Coins, will help to further honor our fallen heroes." AMF funds the Center for Space Education in Florida where students, teachers, and mentors experience building rockets, robotic competitions and other hands-on learning activities. AMF also partners with the National Aeronautics and Space Administration (NASA) to provide technology training to educators throughout the nation with a particular emphasis on space-related technology. "PCGS is pleased to partner with the Astronauts Memorial Foundation and help support AMF’s mission to inspire future generations of scientists, engineers, and mathematicians through their many programs and outreach activities. 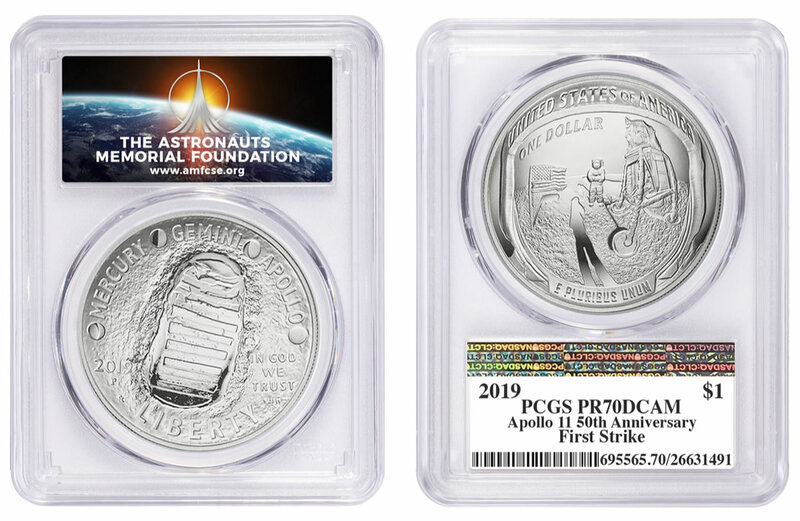 This is a perfect way for the hobby to pay tribute and memorialize the 1969 Apollo 11 mission and the United States Mint’s 50th Anniversary Commemorative Coins," said PCGS President Brett Charville. On January 24, the U.S. Mint will begin sales of four different Apollo 11 coins: A Clad Half Dollar, Silver Dollar, $5 denomination gold coin and a Five-ounce Proof Silver Dollar. Prices for the coins include surcharges of $35 for each gold coin, $10 for each Silver Dollar, $5 for each Clad Half Dollar, and $50 for each Five-ounce Proof Silver Dollar. Under federal legislation authorizing the coins, the surcharges will be divided as follows: one-half to the Smithsonian Institution’s National Air and Space Museum’s "Destination Moon" exhibit, one-quarter to the Astronauts Memorial Foundation, and one-quarter to the Astronaut Scholarship Foundation. "In addition to the mandated surcharges, we will donate 50% of the $18 label fee from encapsulation of all Apollo 11 50th Anniversary Commemoratives and other qualifying coins that receive the special insert," explained Charville. Full submission guidelines are available here: https://www.pcgs.com/labels. 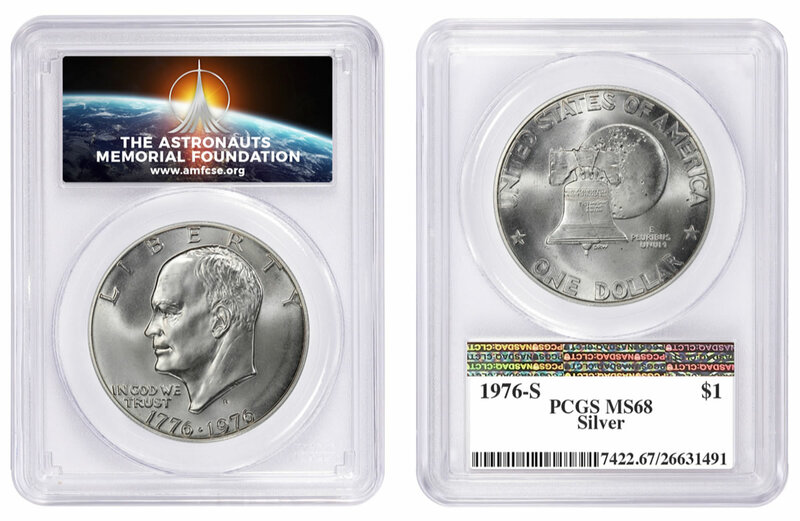 The PCGS Set Registry® will be hosting a new set for coins featuring the special Apollo 11 50th Anniversary label featuring all of the above coins. Since its founding in 1986, PCGS experts have certified over 40 million coins from over 100 different counties with a total market value of over $34.5 billion. A sucker is born every day. If you think $54 for two clad coins is cheap, I shutter to think what expensive looks like. I know you are kidding but with all due respect, $54 for $1 worth of pocket change is down right fraudulent. The mint should be ashamed!!! They are preying on the Kennedy collectors who need this coin for their collection. It’s a sad state of affairs in our hobby. AGreed, I have no need for EVERY JFK 50c they can come up with,reverse proof semi-clad and burnished surface combo soon,,,, in reality we need some nEW COINS, JFK & FDR coins are so old in design, stagnent….they already protected the Jefferson nickel to like 2200…….I would like a return to Flowing Liberty or modern heroes…. I hear that they will have a limited number of coins that were struck on the International Space Station. A label collectors dream come true – again !! !